These are lyrics by Rod Stewart that we think are kind of repetitive. Rod Stewart's, "Every Picture Tells A Story"
Do you get the feeling he's forever young?? 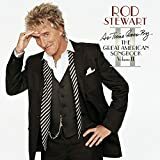 Rod Stewart's, "Tom Traubert's Blues"